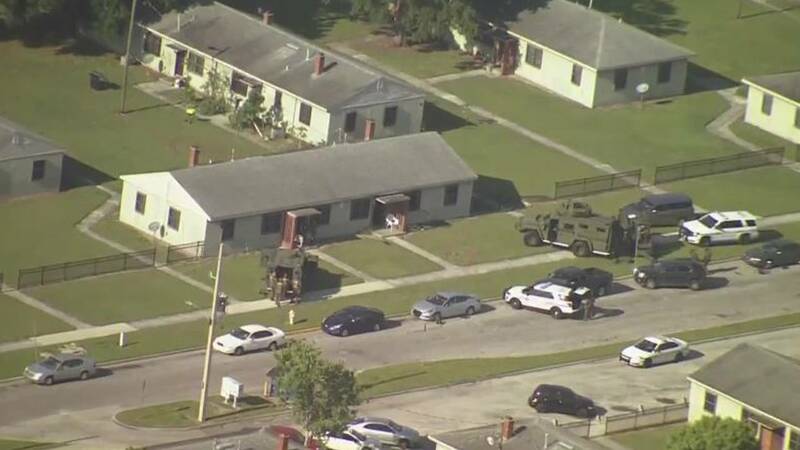 ORLANDO, Fla. - One man was arrested and another remains at large after a SWAT standoff in Orange County, officials said. Deputies responded to an incident near Lake Mann Homes in Orlando around 5:20 p.m. Tuesday, according to the Orange County Sheriff's Office. Sky 6 flew over the scene, where multiple deputies' vehicles and what appeared to be an armored vehicle could be seen. Smoke could also be seen coming from the side of a building at the scene. "It was like a little war zone out here, especially when you see all these SWAT and big machines," neighbor Charles Brewster said. "The big 'boom,' 'bam,' all the noise and stuff." Other neighbors were also impacted by the incident. "They knocked on my back door, knocked on my front door and asked me if I can come outside because they needed everyone to evacuate," Shameka Johnson said. Officials with the Orange County Sheriff's Office said Omar SuarezTorres, 30, was inside a stolen car in the area before entering the home that deputies surrounded. According to the arrest report, SuarezTorres showed up to the home of his former brother-in-law the night before the standoff with a stolen motorcycle and hid it inside the house. On Tuesday, he showed up to the house again. His former brother-in-law refused to let him and the other suspect in. The two still forced their way inside, where they were later found hiding, according to the report. The standoff lasted 4 1/2 hours. After deputies captured SuarezTorres, they got a search warrant for the home and found the stolen motorcycle inside. Investigators said officers used gas canisters to get SuarezTorres out of the house. All the damage to the building is from investigators trying to get SuarezTorres out of the house. It is unknown who will pay for the damage to the home. Brewster said those responsible for the damage should be responsible for having it fixed. "If they tore it up, fix it. If I hit your car, I got to (fix) it, so whether I was wrong or right," Brewster said. SuarezTorres has been charged with burglary of a dwelling and grand theft auto. He remains in jail on a $5,150 bond. A judge ordered him not to have any contact with the victim or any witnesses in the case. Another suspect, who has not yet been identified, is at large, according to investigators.